Several years ago when I was recovering from cancer treatments, a friend recommended that I start using a rebounder for exercise. That way, every cell in my body could be oxygenated in one brief, simple rebounder workout, helping rebuild my strength quickly. She was right. With just a few minutes a day of gentle bouncing, I began feeling better quickly and, in no time, my strength and endurance were back to normal. I'm well now, but I still enjoy my mini-trampoline workouts. Not only are they good for body and soul, they're lots and lots of fun! You don't have to be recovering from an illness to reap the benefits of using a rebounder for exercise. It's a great workout for just about anyone who can stand upright and maintain a fair amount of balance. If you're not sure that's you, check with your doctor first! The advantages of rebounder exercise are many. First, you can exercise by yourself, in the comfort of your own home. No gym membership necessary which brings us to our second point: it's cheap exercise. The only piece of equipment that you need is the rebounder or mini-trampoline (the names are used interchangeably). I'll give you some recommendations about that below. Next advantage, rebounding is a great choice whether you're totally out of shape, in perfect shape and want an additional cardio/oxygenizing workout, or anywhere in between. If you fall into the first category, your workouts will start out short, just a few minutes as your body tolerates. If you fall into the totally-fit category, you'll just bounce for a longer period of time and add plenty of upper body movement to your workout. One of the most important advantages of exercising using a rebounder is the oxygenation aspect that I mentioned above. What that means is that as you work out, breathing faster and deeper, your respiratory system absorbs more oxygen and your cardiovascular system pumps that oxygen-rich blood through every cell in your body. You know that oxygen is essential if you're a living, breathing human being, but what you might not know is that high levels of oxygen have been shown to fight disease, including cancer. In fact, it has been proven that cancer cells can't exist in the presence of oxygen. While we obtain oxygen from drinking lots of water and eating the right foods, exercise that makes us breathe more deeply also provides our bodies with a live-giving fresh supply of oxygen. That's why, simply put, exercise is so important in maintaining, or rebuilding, a healthy body. Breast cancer patients and others with lymphatic system issues, consult your doctor about using a trampoline to help rid your body of those toxins. There's one more important advantage of rebounder exercise and that is the effect the workout has on your overall well being. While your body is getting its workout, your mind is having the time of its life! It is so much fun to exercise using a lively workout music playlist. As you bounce, dance, and jump to the music, you can't help but be in a better mood when it's all said and done! Choose something moderately fast with a steady beat. Most importantly, pick music that you like. Start with this huge selection of workout music playlists ranging from classic rock to classical and everything in between. My current favorite is Motor City Hits, a workout mix from The Biggest Loser. Wear comfortable, sturdy shoes or go barefoot if you prefer. 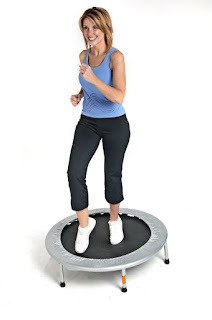 If you're a beginner, place the rebounder within reach of a counter or sturdy chair to grab just in case you start feeling a little unstable (or choose a rebounder with a stability bar). Start by stretching, then bounce "slow and low," keeping your feet on the deck of the trampoline. Personally, I like to just do my own thing, walking, marching, or jumping to the music, adding arm movements as I pick up the pace. If you've never done any rebounding at all, I'd recommend starting with a video such as the excellent one below in order to learn some basic moves. Stick with your comfort level, pushing yourself only when you feel ready, and you'll do fine. Watch the simple rebounder workout on this video, highly recommended, so you can see just how simple, effective, and fun a rebounder workout can be. The price range for rebounders is wide, starting at less than $30 and going up to over $300. The choice is yours and I'd recommend starting on this page at Amazon.com for a quick overview of what's available. The more expensive fitness trampolines are generally very highly rated, but then so are many of the cheaper models. Besides your budget, keep in mind your state of health. A stability bar is a feature that you'll find helpful if you have an issue with balance. When I was sick, having the bar to hold onto while I bounced was very important. These days I'm comfortable going without the bar and leaving more space around me. I've never used resistance bands like the ones included on this inexpensive but well-reviewed Gold's Gym Mini Rebounder, but customers seem to love this model. My bottom line advice? Read the reviews and choose the best model you can afford. As many reviewers say, you get what you pay for. As for me, I'm fine with my 36-inch, non-folding model with elastic bands (not springs) and no stamina bar. Your mileage may vary. The answer is a resounding, "Yes!" unless your doctor tells you otherwise. It's simple, cheap to get started, it will improve your health, and it's the most fun exercise to do day or night, rain or shine, in the privacy of your own home. What's not to like about that! Like the idea of improving your health by using a rebounder for exercise? I'd love if you'd share your thoughts on the subject in the comment section below. Jasmine, thanks so much for contributing to the conversation! A folding rebounder really is a good idea. I'm fortunate that our bed sits high above the floor so I can just slide mine underneath. I really appreciate your input. Very helpful! This sounds like a great idea. Thanks for the suggestion. Thanks, Mary Beth. Let me know if you give it a try! I definitely love the idea of being able to get an easy workout inside your own home! It sounds like a wonderful suggestion for anyone who can bounce on a trampoline. Weather is such a factor in exercise, Cynthia, from leaving the house just to get to the gym, to not walking or running because it's cold or rainy outside. No excuses with a rebounder which you can even use while you're watching TV. So convenient. Thanks! Rebounders are really fun to exercise on. I gave mine to my granddaughter when I moved. Maybe I should get another one! Maybe you should, Heather! I like that they're fun for people of all ages, including granddaughters AND grandmothers! I would love to try that, but since I have bad knees some metal parts fusing my neck and an artificial big toe joint, I'd better talk to my doctors first. I've always wanted to bounce. It really is fun, Trish! Take one rebounder, add your favorite music and go for it! :) Appreciate your visit! Now that looks like a fun way to exercise. And small enough to fit into even a small apartment. Interesting review. Yes! Another advantage is the small space you need. Thanks for that reminder, Elf! Hope you'll try it.